Georgia’s Public Defender, Nino Lomjaria has released the photos of her office, which damaged during the Tuesday night earthquake. The Ombudsman claims the building is not safe and asks all state institutions if they can provide some space for her employees until they find a new building for headquarters. 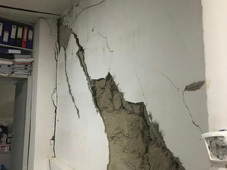 “As a result of the earthquake, the cracks on the walls of our office have worsened. Some of our departments are located on the floors which are below the ground, which creates difficulty of evacuation. This is why we decided to move our services to other places,” Nino Lomjaria’s Facebook post reads. An earthquake measuring magnitude 6 struck Azerbaijan’s Zagatala district on Tuesday night at 22:40, the Republican Seismic Survey Center of Azerbaijan National Academy of Sciences of Azerbaijan told APA. 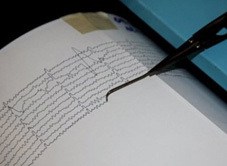 According to Azerbaijani media, the tremor was felt in several regions, especially in Shaki, Gakh, Balakan and Zaqatala. The tremor felt strong in Georgia too, but as reported there were no calls to 112 about damaged buildings or injuries. The Seismic Monitoring Center of Georgia reports that there was around 4 magnitude earthquake in Tbilisi while it was 5.7 at the Georgia-Azerbaijan border. In Georgia, the epicenter was Dedoplistskaro, Kakheti Region. On June 6, at 8am, there was another earthquake 8 kilometers away from Georgia’s border with Armenia. The second earthquake of around 4 magnitude near the border did not spread as strongly. The Survey for Seismic Protection Agency of Armenia on Wednesday recorded a magnitude- 3.3 earthquake in the country. The seismic activity occurred 11 km southwest of Bavra village, its hypocenter was 10km beneath the surface, and it measured magnitude of 4 to 5 at the epicenter. News.am reports that the quake was followed by three aftershocks measuring magnitude 0.8, 1.5 and 1.6, respectively. The tremor was felt in Bavra—with magnitude 3 to 4, and in Gyumri—with magnitude 2 to 3.